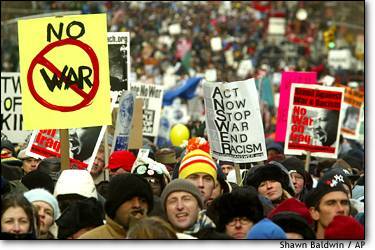 June 5 — The build-up to the U.S. invasion of Iraq triggered the largest antiwar rallies since the Vietnam era, both in America and abroad. Yet the chants of millions of protestors—including “Regime change starts at home” and “Support our troops, bring them home”—seemed to fall on deaf ears in Washington. THE DECISION to invade had apparently been set in stone long before grass-roots opposition had really gotten rolling. Of course, had the military conflict dragged on, then street rallies might have mattered. But the word “quagmire” never did rise to the headlines, and in the end, the peace rallies didn’t stop the war. One way of interpreting the failure of the peace movement to affect U.S. foreign policy is that it failed strategically. While Secretary of Defense Donald Rumsfeld planned (and perhaps executed) a 21st-century war plan in Iraq, antiwar protestors largely relied on 20th-century tactics. Street marches may be the peace movement’s equivalent of heavy armor and lots of infantry—which has been supplanted by high-tech weaponry that supposedly requires fewer troops. Maybe rather than taking to the public square, protestors should have taken to the new commons: the Internet. Recent online social movements range from relatively straightforward petitioning drives (many of which can be found at the clearinghouse thepetitionsite.com) to the innovative (like voteswap.com, which allowed people in hotly contested states who wanted to vote for Nader in the 2000 elections but did not want to tip the state into Bush’s column to trade their vote with Gore supporters in states where the outcome was pretty much already determined). Straightforward approaches, like e-mail and Web-based petition drives, generally adapt a classical political strategy and apply it to the relatively new medium of the Internet. The upside of the ease by which letters can be e-mailed to senators and petitions can be drawn up and circulated is also their downside: they get more easily ignored by public officials who know that e-mail is cheap, so to speak. Voteswap.com, by contrast, does something through the Internet that would not have been possible in the early 1990s. Likewise, underdog Democratic presidential candidate Howard Dean has used the Internet site meetup.com to organize local volunteer campaign groups. So far, there are 25,000 people who have signed up and about 225 monthly meetings across the country. The most interesting uses of Net technology for political protest are even more innovative and radical than Voteswap and Meetup. One interesting example is Electronic Disturbance Theater (EDT): a New York-based group that organizes virtual sit-ins (www.thing.net/%7Erdom/ecd/ecd.html ). How EDT works is this: they publicly distribute an applet called FloodNet that, when activated, sends automatic browser “reload” requests to the targeted Web site every few seconds. EDT then organizes specific times where certain Web sites will be hit by thousands of protestors. The hope is to bring down the site. For example, in 1998, in support of the Zapatista autonomy movement in Chiapas, Mexico, EDT targeted the servers of the Pentagon and Mexico’s president Ernesto Zedillo. In January 2002, 160,000 people downloaded FloodNet from the EDT Web site and deluged the World Economic Forum site; the server failed after a few hours and stayed down for the rest of the week. Ricardo Dominguez, EDT’s cofounder, claims that the official goal of such sit-ins is not necessarily to disable Web servers but merely to disturb them; in fact, EDT calls the actions “performances.” Of course, the distinction between disturbing and hacking is a fine line that is walked with a wink and a nod. Another fairly radical group is the Bureau of Inverse Technology (bureauit.org), or BIT. Like many of these groups, this is an anonymous organization that straddles the line between activism and art, billing itself as an “information agency serving the information age.” One of the latest BIT projects is the antiterror line. This is a phone number—actually two, one in the United States and one in Britain—to monitor infringements on civil rights by government authorities in the wake of antiterror legislation. The principle is simple: you, the user, preprogram the number into your cell phone and if you are ever confronted by the police, press the number and the machine at the other end of the line will record the interaction as evidence. Marchers going off to a protest might gear their phones up; blacks who are likely to experience racial profiling might also want one-touch dialing, and of course other populations that are particularly vulnerable under the USA Patriot Acts and its possible successors—such as foreigners, particularly those from Islamic countries—might want to be on the ready. If you are not able to record the actual interaction (after all, it’s pretty hard to get your cell phone to work if you are being bludgeoned by a policeman’s billy club), then you can call to report the event to the phone number after the fact. In this way, the Web server will build an archive of information about the government that—in its public accessibility—stands in stark contrast to the way the Feds are increasingly collecting secreted information about the population. A common thread in the online activist and arts community is the use of “kits” to enlist other activists. A kit can be as simple as EDT’s FloodNet program or a complicated as BIT Radio: instructions on how to build a transmitter to jam local radio programming, overriding it with an activist message. BIT did this in New York City during the World Economic Forum, broadcasting environmental information over National Public Radio’s frequency. The brevity of the illicit broadcasts prevents the transmitter stations from being found out. Anyone across the world can theoretically set up a BIT Radio station if they follow the instructions that are downloadable at the BIT site. Another “hactivist” tradition is that of impersonation. While impersonation for political purposes has a long tradition—dating at least as far back as 1703, when Daniel Defoe was arrested for distributing his satire of Anglican Tories, which was taken to be serious at first—the Net opens up completely new possibilities. For example, the Yesmen (theyesmen.org ) have pretended to be the World Trade Organization, by registering the site of the organization that the WTO was meant to replace (gatt.org). They then issue press releases that fly in the face of official WTO policy; some unwitting journalists then publish stories based on them—all the while documenting the reaction. They also accept speaking invitations on behalf of the WTO through the Web site. The Yesmen also registered the site dow-chemical.com. They used this platform to explain why Dow Chemical will not take responsibility for the 1984 Bhopal, India, chemical disaster nor offer more than $500 compensation per victim. The response was overwhelming. However, for added irony, when they registered the site they chose to list it under “James Parker,” the son of the Dow’s CEO, and used his real address. When the real Dow found out about what was going on, they immediately got James Parker to re-register the domain name as his own, deleting the misinformation. End of story—for now at least. No worries for the Yesmen—they had already achieved their purpose by getting plenty of media attention to the issue, which had been long forgotten by most Americans. To varying degrees, what EDT, BIT and the Yesmen share in common is the ability to generate media attention for their actions and to draw together like-minded individuals across vast spaces, thereby reducing the need to generate a crowd in any particular locality. One BIT engineer calls this “scale.” Beside unifying a geographically diverse protesting community, another benefit of this kind of networked activism that BIT points to is the fact that—for the most part—the police cannot shut you down with horses, water hoses, rubber bullets and mass lock-ups; they can merely reregister your domain name or take down your server. The biggest payoffs may to be in the linkage of the Net to actual live protest marches. The peace marches of Feb. 15 represented the largest worldwide protests ever recorded. As it turns out, they were not completely 20th century. They had been coordinated by many Net activists, but they still required people to show up, shout, beat drums, get arrested and so on. They just happened to not work. But maybe they are just the beginning. If the Bush administration has more war plans lurking up its sleeve, the protestors will be ready—on line and off. Dalton Conley directs the Center for Advanced Social Science Research at New York University. He is a member of the National Bureau of Economic Research and the author of “Honky,” a memoir, and “The Pecking Order: Which Siblings Succeed and Why” (due out in February). Would you recommend this story to other readers? • Terror Watch: Will CIA Bowdlerize Baer Book?